Get information about STANDING FIRM and the news in the southwestern Pennsylvania region. The 350 attendees who filled the room on Wednesday at the Omni William Penn, Downtown, were riveted by speaker Susan Still’s story of many years of abuse by her husband and her employer’s actions to help her to safety. As the separation of work and life becomes even more blurred—fueled by ubiquitous access, continuous optimization and wider responsibilities—ensuring the safety of employees becomes even more imperative. While safety is often focused on the workplace itself (keeping people free from accidents, hostile situations, and safety code, etc.) we now realize that the impact of each employee’s personal safety outside of work has significant impact on company morale and productivity. Lynette Lederman of Squirrel Hill was named winner of the STANDING FIRM Community Champion Award. Ms. Lederman, who has been working for the City of Pittsburgh for over 10 years, covers issues within Squirrel Hill and other Jewish communities. Standing Up Together: KDKA anchor Susan Koeppen emceed the event and New York Times bestselling author Leslie Morgan Steiner shared her story of abuse and survival and the importance of a workplace that is aware and prepared to deal with issues of partner violence. The Village of Sewickley took action in learning how to recognize and respond to domestic violence, particularly as it affects the workplace. STANDING FIRM staff members, Susan Nitzberg and Barbara Penner, in conjunction with the Sewickley Valley Chamber of Commerce trained businesses what to say and what to do when faced with a domestic violence issue at work. Aired Saturday, December 7, 2013. SF Associate Director, Outreach, Susan Nitzberg, with Rob Conroy (CeaseFirePA), and exhibit director Kate Lydon, were interviewed for the Saturday Light Brigade Radio show. The exhibit was a vehicle to call attention to the various forms of violence and its impact on our society. Dr. Patricia Cluss’ letter to the Editor at the Post-Gazette draws the link between the recently released CDC report of the shocking prevalence of partner violence and the hidden nature of partner violence as a workplace issue. 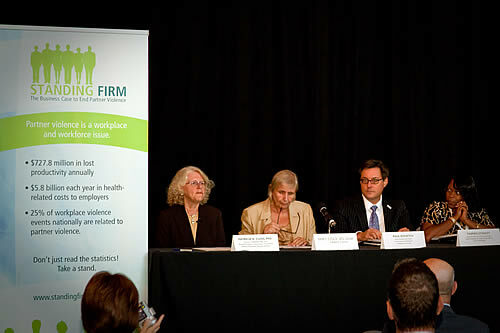 Dr. Cluss speaks at the public launch of SF at the PHRA conference in September. STANDING FIRM resources are highlighted in a letter to the editor about Pitt coach’s firing. This article was submitted by Patricia Cluss, director of STANDING FIRM; Judy Hill-Finegan, director of the Personnel & Civil Service Commission for the city of Pittsburgh; and Greg Peaslee, senior vice president of human resources for UPMC. An article from January 28, 2010, describing the City of Pittsburgh’s efforts to pass a domestic violence ordinance for all employees. STANDING FIRM Director, Dr. Patricia Cluss, describes the initiative.